This sugary exfoliating scrub melts away stubborn debris and blackheads lingering underneath your pores and sloughs off with efficacy old dead skin cells. 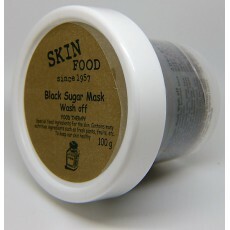 It contains brazilian black sugar granules that dissolves slowly while you massage in the face, preventing skin irritation. Formulated with shea butter and meadowfoam seed oil, this scrub do not only clears your skin, but softens and moisturizes it too. This product collected 484 reviews in other stores and 148 reviews found in this external website. After your double cleansing (oil-based and water-based cleansers), apply ample amount to moist face, avoiding eyes and lips. Gently massage face until most of the granules have dissolved, paying extra attention to areas that needs more exfoliating. Wash it off right away with water or let it sit for around 10-15 minutes. Rinse thoroughly with lukewarm water and pat dry. For sensitive skin: you can mix a little bit of water to the cream to make it less irritating or add a little cleansing oil to it too if you want. TIPS: Use this 1-2x a week (usually at night when you have plenty of time) or more if you think it is necessary, but only apply to part of the face that needs exfoliating like your chin or around nose to prevent irritation. Over doing exfoliation is not good for your skin.